Ulaanbaatar or Ulan Bator (Mongolian: , , Ula?anba?atur, literally "Red Hero") is the capital and the largest city of Mongolia. An independent municipality, the city is not part of any province, and its population as of 2014 is over 1.3 million. Located in north central Mongolia, the city lies at an elevation of about 1,310 metres (4,300 ft) in a valley on the Tuul River. It is the cultural, industrial, and financial heart of the country. It is the centre of Mongolias road network, and is connected by rail to both the Trans-Siberian Railway in Russia and the Chinese railway system. Human habitation at the site of Ulan Bator dates from the Lower Paleolithic. Alexey Okladnikovs archeological work in 1949 and 1960 revealed many Paleolithic sites on Mt. Bogd Khan Uul, Buyant-Ukhaa and Mt. Songinokhairkhan. In 1962 various Paleolithic tools were discovered at Mt. Songinokhairkhan as well as Buyant-Ukhaa (23 stone tools) that scholars date from 300,000 years ago to 40,000-12,000 years ago. Okladnikov also revealed an Upper Paleolithic (40,000-12,000 years ago) site on the south-east base of the Zaisan Hill on the northern edge of Mt. Bogd Khan Uul. Byambyn Rinchen mentions it as an inspiration for his prehistoric novel Zaan Zaluudai. The lower strata of this bistratified settlement located at the present-day Zaisan Memorial revealed tools and materials fashioned according to the Levallois technique. These Upper Paleolithic people hunted mammoth and wooly rhinoceros, the bones of which are found abundantly around Ulan Bator. Red ochre rock paintings from the Bronze Age (1st millennium BCE) are to be found at Ikh Tenger Gorge on the north side of Mt. Bogd Khan Uul facing the city. The paintings show human figures, horses, eagles and abstract designs like horizontal lines and large squares with over a hundred dots within them. The same style of painting from the same era is found very close to the east of the city at Gachuurt, as well as in Khovsgol Aimag and southern Siberia, indicating a common South Siberian nomadic pastoral culture. Mt. Bogd Khan Uul was probably an important religious cult location for these people. Bronze Age square slab tombs are found at the Shajin Khurakh and Tur Khurakh gorges of Mount Bogd Khan Uul facing the city. To the north of Ulan Bator there are the vast Noin-Ula Xiongnu (Hunnu) royal tombs which are over 2,000 years old. A Xiongnu tomb has been found in Chingeltei district. The Xiongnu tombs of Belkh Gorge near Dambadarjaalin monastery are under city protection. The Xiongnu tombs of Mount Songinokhairkhan however are under national protection. Wooden cups, plates, ceramic vessels and a 12 branch deer horn were found in the "Xiongnu Queen Tomb" (Hunnu Khatni Bulsh) at the Baruun Boginiin Am gorge of Mount Bogd Khan Uul. Six tombs around this tomb show signs of ancient looting. The Wuhuan carried out large scale looting of Xiongnu tombs in 87-74 BC. Located on the banks of the sacred Tuul River ("Khatun Tuul" or Queen Tuul in legend), the area of Ulan Bator was well within the sphere of nomadic empires such as the Xiongnu (Hunnu) (209BC-93AD), Xianbei (Sumbe) (93AD-4th century), Rouran (Nirun) (402-555), Göktürk (555-745), Uighur (745-840), Khitan (907-1125) and Mongol Empire (1206–1368). At Nalaikh District there is the important Stele of Tonyukuk (c. 722 AD) with an Old Turkic inscription in the Orkhon alphabet. A balbal or ancient human statue was chosen as the ceremonial foundation site (Shav) of the city when it settled in 1778 at its current location. Presently, modern stone turtle sits atop the spot of the ancient balbal near Sükhbaatar Square in the city center. 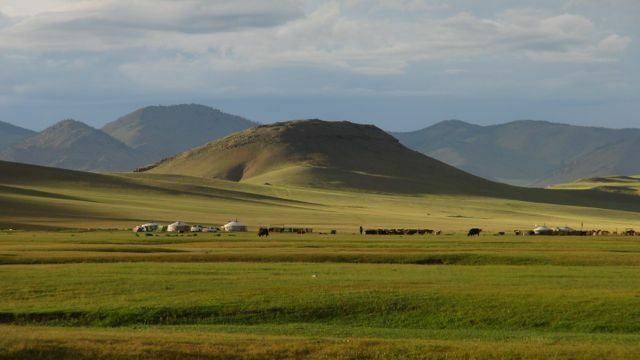 Wang Khan Toghrul (1130-1203) of the Kerait, a Nestorian Christian monarch who was identified as the legendary Prester John by Marco Polo, is said to have had his palace here (the Black Forest of the Tuul River) and forbade hunting in the holy mountain Bogd Uul. The ruins of his palace (15x27 metres with a gate facing south) was found in Songinokhairkhan District in 1949 and excavated by D.Navaan in 2006. This brick palace influenced by Chinese architecture, later also called the Third Palace of Genghis Khan or Yesui Khatuns palace, is where Genghis Khan stayed with Yesui Khatun before attacking the Tangut in 1226. A drainage channel carried roof water out through the east and west gates of the complex. In 2003 Japanese and Koreans made special programs about this palace where many important events of Genghis Khans life took place. Genghis Khans father Yesukhei became blood brothers with Toghrul here and later Genghis Khan himself became son of Toghrul at this place. Genghis Khan...crossing the Indus River chased Jalaldin Sultan and Khan Malik till the land of the Hindu, but they escaped. So he took many border people of the Hindu region captive and came back bringing many camels and goats. From there Genghis Khan returned, spending the summer at the Irtysh River and reaching the Black Forest of the Tuul River in autumn of the Year of the Rooster (1225), where he set up his Ordo (royal camp) and spent the winter. (SHM 264) He rode against the Xi Xia the next year taking Queen Yesui with him. On the 5th, we made fifty li, which should actually be reduced to thirty-five li (17km), West-North-West, because of a big detour we made in the mountains, holding to the south and south-west to avoid the marshes of the plains. We camped on the banks of the Tula, which separates into many branches, still ornamented by beautiful trees. On the way we passed many streams that empty into the River, and for a distance of about thirty li, we followed the edge of a high mountain, called Han-alin (Mount Bogd Khan Uul), covered by a grand forest of pine and fir trees, full of bears, wild boars and deer. We camped in the valley that is at the foot of this mountain, on the bank of the same River. The Manchu envoy Tulišen wrote an account of his travels through this region in 1712, describing how his party rested and fished ten to twenty salmon and pike in the river "Tu-la" while one Ko-tcha-eur-too killed a deer with a gun in the "Han-shan" (i.e., Khan Uul). He also describes the "rich and luxuriant" nature around the "Sung-kee-na" mountains (i.e., Mount Songino Khairkhan). 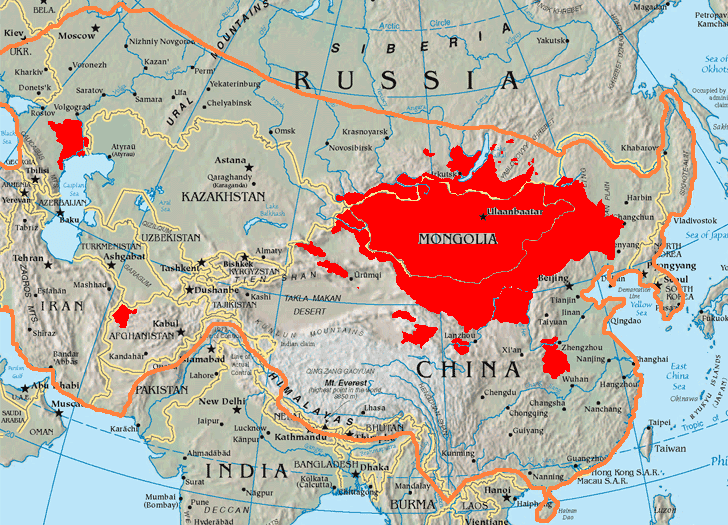 Before Khalkha Mongolian nobles went and pledged allegiance to the Manchu emperor at Dolon Nor (formerly Kublai Khans summer capital Xanadu) in 1691, the area of present-day Ulan Bator was under the control of Tusheet Khan Chakhundorj the brother of Zanabazar. In 1691 Chakhundorjs eldest son Galdandorj was given the title Jun Wang at Dolon Nor and given the area of present-day Ulan Bator. From that time onwards it became a clearly demarcated hereditary princedom called the Darkhan Chin Wangiin Khoshuu (Banner of the Darkhan Chin Wang). The Banner was centered on Mount Bogd Khan Uul and its boundaries are described in historical records of the period. Galdandorj (1691-1692) was the first Darkhan Chin Wang. His successors are: his eldest son Dondovdorj (1692-1743), Rinchendorj (1743-1755), Khajivdorj (1757-1759), Gejeedorj (1759-1771), Tsevdendorj (1771-1774), Sundevdorj (1774-1798), Nyambuudorj (1799-1832) all the way till Darkhan Chin Wang Puntsagtseren (1914-1921). Starting from 1728 till 1921 the 21 banners of Tusheet Khan Aimag held the "Khan Uuliin Chuulgan" (Assembly of Khan Uul) every three years at the north side of Mount Bogd Khan Uul, the site of Ulan Bator. The Assembly discussed a wide range of issues including finances, military census, livestock tax and legal issues. There were 26 Presidents of the Khan Uul Assembly starting from Tusheet Khan Vanjildorj (1728-1732) till Puntsagtseren (1914-1921). There were also a total 30 Deputy Presidents or Speakers. The 2nd Jebtsundamba Khutuktu was born at Mount Songinokhairkhan in present-day Ulan Bator in 1724 as the son of Darkhan Chin Wang Dondovdorj and Tsagaan Dari Bayart. Dondovdorj carried the titles Jun Wang, Darkhan Chin Wang, Khoshoi Chin Wang and Efu and also sat on the Tusheet Khan throne for two years (1700-1702). He played a part in bringing Urga inside his banner territory. From 1733 to 1743 he was both the Said (Minister-governor) of Urga and the President of the Khan Uul Assembly. One of his wives was Amarlingui Hichiyengui the 6th daughter of the Kangxi Emperor whom he received in marriage in 1697. Her tomb the Gunj Temple (1740) is partially intact in the forests north-east of Ulan Bator. Dondovdorj, an accomplished poet, composed the song "Tumen Ekh" praising a race horse. In 1696 Zanabazar and the Khalkha Mongolian nobles returned from Dolon Nor and camped at the north side of Mount Bogd Khan Uul. The gorge where khans and princes camped was called Tur Khurakhyn Am (State Gathering Gorge) while the one where monks and abbots camped was named Shajin Khurakhyn Am (Religion Gathering Gorge). Nobles and lamas continued to meet at this place for the next 330 years. Nukhtiin Am, on the south of Ulan Bator, was where Zanabazar (1635-1723) consecrated and meditated under a tree called Janchivsembe, the shadow of which was used to choose the location of Gandan Monastery in 1838. Owing to its high elevation, its relatively high latitude, its location hundreds of kilometres from any coast, and the effects of the Siberian anticyclone, Ulan Bator is the coldest national capital in the world, with a monsoon-influenced, cold semi-arid climate (Köppen BSk, USDA Plant Hardiness Zone 3b) that closely borders a subarctic climate and humid continental. The city features brief, warm summers and long, bitterly cold and dry winters. The coldest January temperatures, usually at the time just before sunrise, are between ?36 and ?40 °C (?33 and ?40 °F) with no wind, due to temperature inversion. Most of the annual precipitation of 267 millimetres (10.51 in) falls from June to September. The highest recorded precipitation in the city was 659 mm (26 in) at the Khureltogoot Astronomical Observatory on Mount Bogd Khan Uul. Ulan Bator has an average annual temperature of ?0.4 °C (31.3 °F). The city lies in the zone of discontinuous permafrost, which means that building is difficult in sheltered aspects that preclude thawing in the summer, but easier on more exposed ones where soils fully thaw. Suburban residents live in traditional yurts that do not protrude into the soil. Extreme temperatures in the city range from ?49 °C (?56 °F) to 38.6 °C (101.5 °F). Ulan Bator has several museums dedicated to Mongolian history and culture. The Natural History Museum features many dinosaur fossils and meteorites found in Mongolia. The National Museum of Mongolia includes exhibits from prehistoric times through the Mongol Empire to the present day. The Zanabazar Museum of Fine Arts contains a large collection of Mongolian art, including works of the 17th century sculptor/artist Zanabazar, as well as Mongolias most famous painting, One Day In Mongolia by B. Sharav. The Mongolian Theatre Museum presents the history of the performing arts in Mongolia. The citys former Lenin Museum announced plans in January 2013 to convert to a museum showcasing dinosaur and other prehistoric fossils. Pre-1778 artifacts that never left the city since its founding include the Vajradhara statue made by Zanabazar himself in 1683 (the citys main deity kept at the Vajradhara temple), a highly ornate throne presented to Zanabazar by the Kangxi Emperor (before 1723), a sandalwood hat presented to Zanabazar by the Dalai Lama (c. 1663), Zanabazars large fur coat which was also presented by the Kangxi Emperor and a great number of original statues made by Zanabazar himself (e.g. the Green Tara). Puzzle Toys Museum displays a comprehensive collection of complex wooden toys to be assembled by players using sophisticated methods.